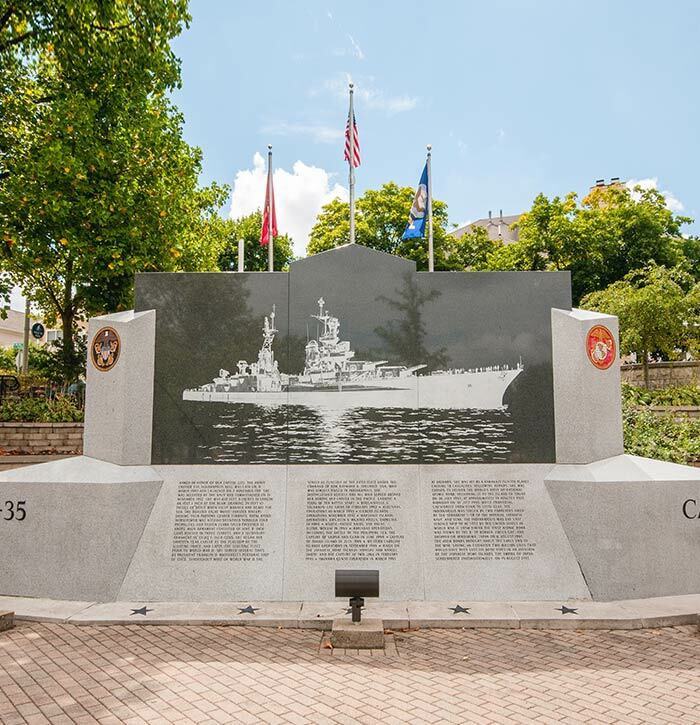 This national memorial is the climax of a 50-year dream by the crew members who survived the sinking of the cruiser USS Indianapolis in 1945. They worked tirelessly to erect a fitting memorial to their missing shipmates until it was formally dedicated in 1995. Located at the north end of the Canal Walk between Senate Avenue and Walnut Street, the gray and black granite memorial is an outdoor site open to the public. It is created in the shape of the cruiser itself, with the story of the ship’s sinking etched on one side and, on the other, the names of the ship’s company and one passenger who made up her final crew. The USS Indianapolis was a heavy cruiser that delivered secret components for the atomic bomb to Tinian Island in August 1945. On its return voyage, a Japanese submarine sank it. Of the 1,197 men who went into the water, only 317 survived. The memorial was formally dedicated in 1995, 50 years after the sinking of the USS Indianapolis. Joseph Fischer designed the USS Indianapolis Memorial.